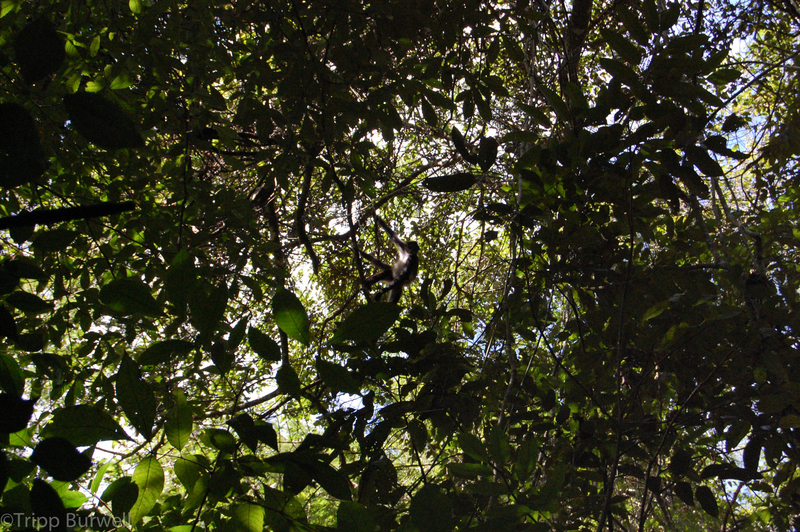 Howler monkeys harangued us as we floated down the brown river. Their invisible, furry faces unceasingly announced our approach. Underneath their clamorous banshee cries, we heard another sound – the low, dull throb of an engine. A spider monkey in Guatemala (less shy than the howlers). 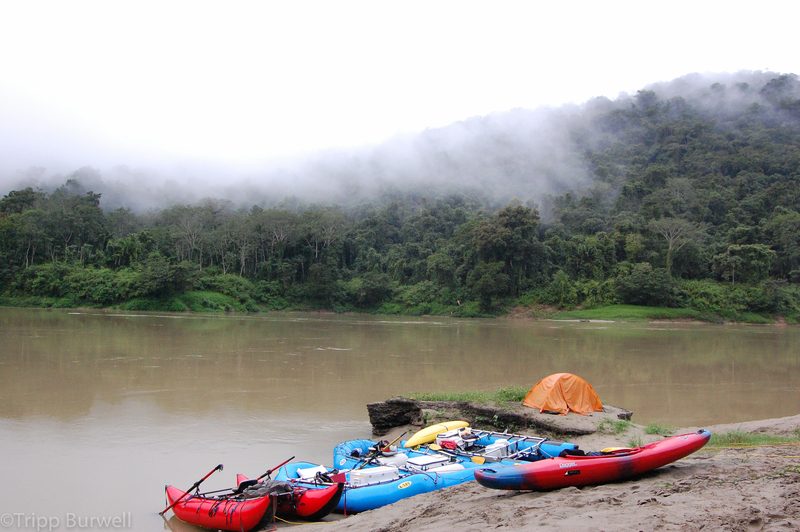 We were floating a remote portion of the Rio Usumacinta, where I was safety kayaking a Sierra Rios trip led by Rocky Contos. 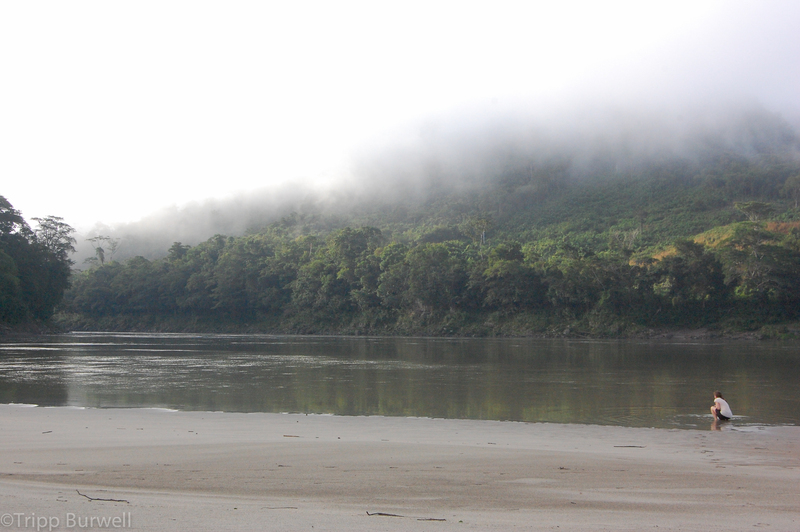 Like many rivers, the Usumacinta forms a border. In this case, Mexico sat on the left, Guatemala on the right. At its widest width, the river was a few hundred yards across. Here, the border was undefended, mostly unpopulated, really just jungled, particularly on the Guatemalan side. Near the ruins of one abandoned Mayan city, we saw jaguar prints in the mud. When we heard the engine, it had been a day or two since we had seen other people. Kate Daniel looks at Mexico. 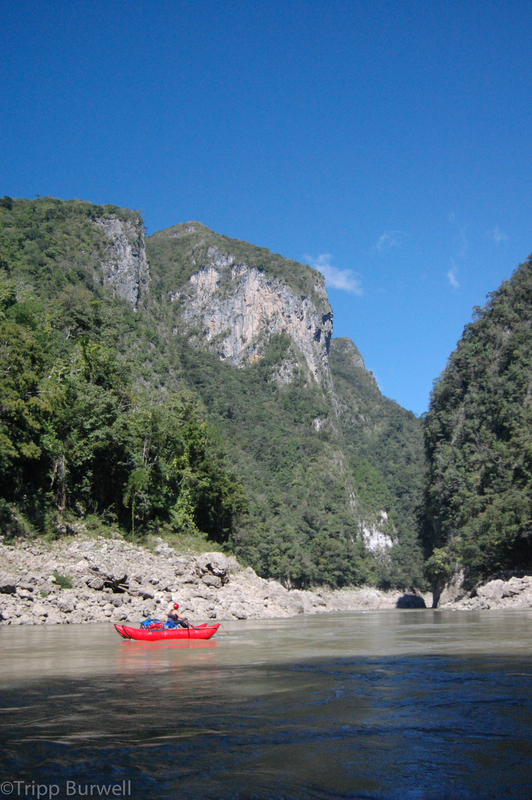 Previous reports of the area had mentioned the presence of Guatemalan bandidos that attacked boats following the ancient Mayan pathways (see: Sacred Monkey River by Chris Shaw). Since then, the Guatemalan Army had routed the bandidos, but still, the engine roused my nerves. The boat came around a corner – a long, slender wooden motorboat with perhaps 20 men and teenage boys aboard it, sitting patiently. Alejandro, one of the Mexican guides on our trip, later confirmed what I had presumed, that these guys were on their way to the U.S., illegally. I thought about the journey ahead of them, which we had just flown and driven over on our way down. All of Mexico, including the empty, dry northern third, lay before them. After all that, they would have to contend with the fences and guards of the U.S. Border Patrol. No friends. Everyone out to get them, sketchy coyote “businessmen” in particular. All for the promise of a better life in the U.S.
“You can only wish them luck,” Alejandro remarked wistfully. He had already been to the U.S.
A large percentage of Mexicans with whom I spoke had been to Clearwater, Florida, or Arlington, Texas, or somewhere in California or Arizona and lived or worked there 1 or 5 or 10 years, usually doing construction. They would ask me where I was from and tell me that, yes, there is a Mexican consulate in Raleigh, North Carolina. In the 4 nights we slept at different camps in Guatemala, we never so much as presented ID. We just crossed from one country to the other as we pleased. 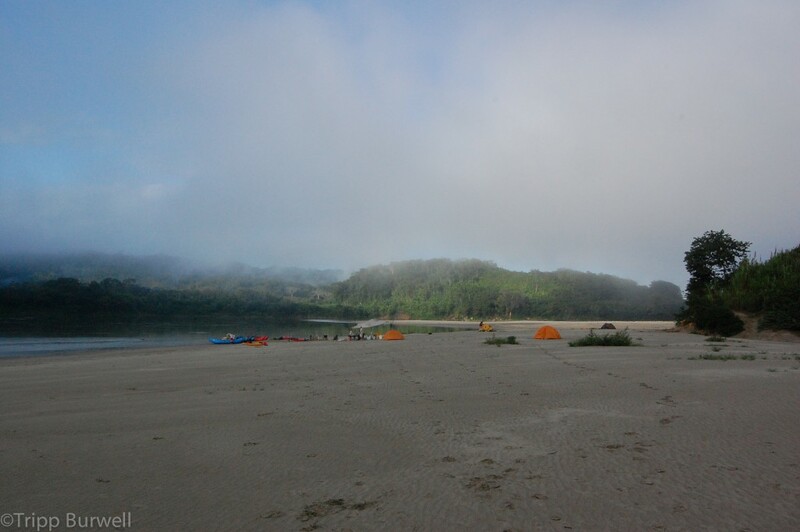 Camp on a Guatemalan beach. Mexico is in the background. One time the Guatemalan Navy passed us by on speedboats going downstream, but paid us no heed. So many people embarking on such a hard journey. Having seen them in a crucial step, how could you not empathize with them? Eventually we floated out to the road and began the slow slouch back to the U.S. As I flew back over the whole of Mexico, I watched as civilization seemed to disintegrate in its barren northern deserts. I thought of those men I had seen and of those I hadn’t. Camp in Guatemala. Mexico is in the background. Well stated, I had those thoughts as well. It does change your perspective a bit once you see where and how the long journey to the USA happens. That was a good trip on the Usumacinta. I hope our river paths cross again. I head down south for boating every year, this year I will leave in August to explore through to Dec. Give me a ring to join!